It's happening all over the world. Led largely by teen girls, a school strike to call adult attention to our planetary house afire has been held today in national capitals and small towns alike. The current count is 1693 events occurring in 106 nations with high concentrations in Australia, Belgium, Brazil, Canada, Chile, Czechia, Denmark, Finland, France, Germany, India, Ireland, Italy, Mexico, New Zealand, Poland, Portugal, Spain, Sweden, UK, and USA. magazine article, which is also proof that the movement is successfully grabbing the attention of us adults: sympathetic to the concern, gently recycling our plastics and driving more fuel-efficient cars while ignoring the urgency of the situation. Here is their mission statement. We, the youth of America, are striking because decades of inaction has left us with just 11 years to change the trajectory of the worst effects of climate change, according to the Oct 2018 UN IPCC Report. We are striking because our world leaders have yet to acknowledge, prioritize, or properly address our climate crisis. We are striking because marginalized communities across our nation—especially communities of color, disabled communities, and low- income communities—are already disproportionately impacted by climate change. We are striking because if the social order is disrupted by our refusal to attend school, then the system is forced to face the climate crisis and enact change. With our futures at stake, we call for radical legislative action to combat climate change and its countless detrimental effects on the American people. We are striking for the Green New Deal, for a fair and just transition to a 100% renewable economy, and for ending the creation of additional fossil fuel infrastructure. Additionally, we believe the climate crisis should be declared a national emergency because we are running out of time." And look at how these compassionately globalized young people seamlessly integrate intersectionality into their disruption of the social order— they understand that THERE IS NO DISCONNECT between the threats of climate-related disaster, poverty and racism, among others. So how can we the climate believers, we the adult teachers and writers and poets do our part to rise up NOW, act up NOW, disrupt our own denial, “face the climate crisis and enact change”? Well, yes, I am working on phasing out plastics from my household (sorry, Trader Joe’s—my nuts are going to have to come from a bulk source). Yes, we are considering how in 2-3 years’ time our family can move to a smaller home with a lighter carbon footprint in a location that supports emission-free transportation. Yes, we just this week switched over to clean wind-powered electricity for our current house. But none of those individual actions will make the impact that is needed now to avert climate calamity. [Go here for a millennial-speak summary of the recent UN-convened Intergovernmental Panel on Climate Change (IPCC).] Instead, our action is needed to pressure our governments, from local town to national to multinational, to put in place the restrictions that our young climate activists can see clearly are needed. How do we do that, we adult teachers and writers and poets? Well, by nature and by profession WE ARE MESSAGERS. WE ARE COMMUNICATORS. Our role at this moment is to amplify the voices of our young people and to convey their message far and wide and deep. Here's my list of a few ways to use your MESSAGING POWER, from easiest & most convenient to most costly of our time and courage. 1) Follow all these teen leaders on social media. Retweet relentlessly, like like like, favorite favorite favorite! This lets them know their message is getting through and spreads it wider. 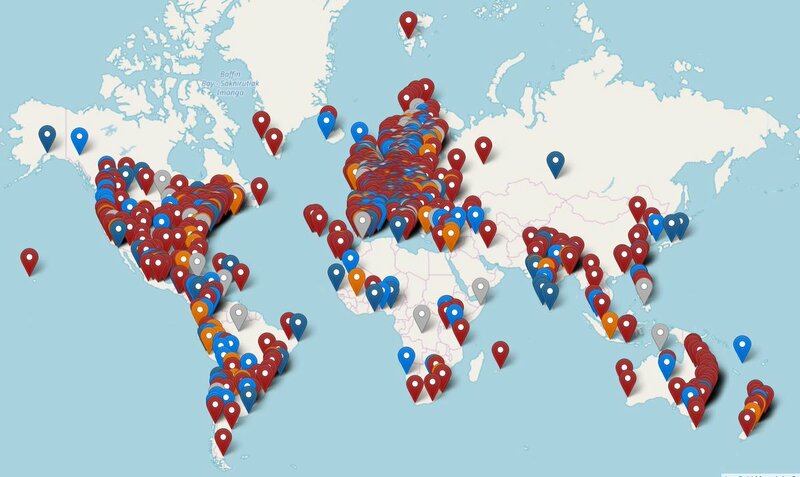 Start searching for teen leaders using #FridaysForFuture and #YouthClimateStrike. Reach outside your comfort zones of location and language! 2) Make sure that every student you teach and every adult you know understands the difference between weather and climate. This should help. 3) Get friendly with Resistbot. "Write to your officials in under 2 minutes! Text the word resist to me on Messenger, Twitter, Telegram, or to 50409 on SMS* and I’ll find out who represents you in Congress or your state legislature, turn your text into an email, fax, or postal letter, and deliver it to your officials." Even if you know your legislators, local, state and national, agree with you on this, your messaging to them matters. Your texts, emails and faxes are counted and tracked. 4) If there are students striking in your school district, support them by messaging their principals and superintendents. Help the adults understand that these students are not "playing hooky," and that they're not missing out on any instruction that is more essential than engaging social orders and political systems in serious critique. 5) Put your money where your mouth is. The best way is to find an organization you trust and be a regular donor that they can count on for income, no matter how little. The dependability often matters more than the amount. Follow this link to find a list of 10 reputable nonprofits addressing climate change. 6) Put your body where your mouth is. If you are a teacher, consider taking a personal (yes, it's personal) or sick day (yes, the planet is sick!) and joining your closest #FridaysForFuture school strike. Lend your bodily support to the students who are sticking their necks out. If you are retired or self-employed and especially if you have children & grandchildren whose future you care about, consider joining or starting your own strike. Set yourself up on a bench with your signs in front of your closest state house on Fridays. Spread the word. If you're an introvert and you don't want to talk to strangers, make up a little flyer to explain what you're up to and how supporters can help. If 14-year-olds can do this, so can we. We can do Numbers 1-6 without Number 7, but I don't think we can do Number 8 without it. 7) Number 7 is GRIEVE. Put your heart where your brain is. We know what we know: humans have, first unwittingly and then with knowledge aforesight, set the planet on a course to destruction within the next 80 years. It's real, and it's sad. Crying is appropriate. Existential despair is a natural response. However, action is a tonic. Just ask Psychology Today: "The good news is that there is evidence to suggest that being an active participant in the fight against climate change increases a sense of self-efficacy, social competence, and creates a range of associated positive emotions." 8) For us messagers and communicators, the action is to WRITE. Writing is an action. Write a story or article for a kids' magazine, write a poem for the kids you know, write an ode to teen activists. Yes, celebrate nature, but don't sugarcoat. Kids can take the truth. They already feel the truth even if they don't know the truth; now they need ways to perceive it, process it, act on it themselves. Adult teachers, writers, poets: gather your grief and get out there and WRITE! Some of our number have already taken that action in their posts for this week. Meanwhile I'm working on a new poem to go with the one I shared a couple of weeks ago that ramps up urgency, because this is NOT a piece of cake. 1.Kimberly Hutmacher has an original poem called "Warning: DIRE" and points us at a pair of useful book for the classroom focused on the effects of climate change on polar bears. 3. Mary Lee posts about a popular song beloved in the 1920's, "Five Foot Two, Eyes of Blue," which she recast in 2017 as "My Gal, Mother Nature." It makes my favorite kind of song: sounds happy, means sad. 4. Michelle Kogan has a commanding list of very specific reasons to strike, a poetic manifesto! 5. Tabatha has found that the Chicago Review of Books has a regular column called "Burning Worlds" which rounds up climate change writing!!! Columnist Amy Brady has a list of the best poems, and Tabatha has chosen a great one featuring bears, bees and Artemis. 6. Similarly, Linda Mitchell has discovered a trove of recorded climate change poems at The Guardian newspaper site and features one called "Storm" read by Jeremy Irons. 10. Linda Baie reports on some freaky evidence of climate change that hit Denver on Wednesday--a #bombcyclone of a sudden snowstorm. 14. Amy nails the whole project of the teenagers in simple terms for the youngest children in an action poem with heart, "Oh, Earth. You are my friend." 15. Ruth in Haiti is not posting specifically about climate change, but her reflection on the quality and steadfastness of the Caribbean sunlight certainly has its place in this discussion. After all, before the mitochondria were the powerhouse of the cell, the sun was the powerhouse of the planet! 16. Ramona and I have shared a Pleasure from the Page in Alice Schertle's "Secretary Bird" poem. I'm glad that her post confirms what I've been worried about--that there is indeed no period at the end of that last line, that our concern must be unstopped. 21. Christie has an original vernal pool "poem of caution" for her kindergarteners that wonders, "Is it too late?" I think not, with her young students getting the education she's providing. 30. Carol offers an eye- and passion-catching digitally illustrated poem that she has used to spread the word far and wide on Twitter. 32. The Eve Merriam poem Catherine shares is fine, but the real highlight of her post is her own Golden Shovel, a spot-on climate change poem with the striking line "They can shut me up but they can't change the truth." 35. Molly wallops us with the truth all over again in 15 words or less. We are going to have give up some of our cookies, and probably all of the frosting. Great post with a spot-on plan of action, Heidi. I am constantly doing the second one on the list. So many folks (thanks to our president) truly don't understand the difference. Perfectly poignant poem choice as well. Thanks for hosting this week. Hi, Heidi. I didn't realize you were this week's host, but it's fascinating to read all of this after talking to you over lunch on Thursday. One of my action items is working on a middle grade book of climate fiction. Lots of research to do! I appreciate all of the resources and ideas you have shared here. Hooray for these young people leading the fight. I have hope, thanks to them. PS -- thanks for hosting, and for marching in DC! Thanks for hosting and this powerful, info packed post Hedi, and all the links too! My post is all on the #ClimateStrike! Thanks for all the info about the Youth Climate Strike. Great list of ways to help the cause. It is heartening to see young people taking positive steps to effect change. Thanks for the call to action and for hosting this week, Heidi! Hi Heidi - Good luck with your action. Thank you for this action, hosting such a crucial topic. It feels good to know the young people are not letting activism on climate change by the wayside. And so many appreciates for the Alice Schertle poem, "Secretary Bird." Potent. Thanks for hosting, Heidi! And what a powerful poem. I've been reading as much as I can about the Green New Deal, and was quite surprised when I read about the founder of Greenpeace not being in support of it. But what you & your family are doing - taking steps at the grassroots level - is the best way to create the groundswell! Thank you Heid for everything. I cannot go tomorrow, have to be at the bookstore, but I will find the students and support them. I just read that Greta Thunberg was nominated for a Nobel Peace Prize: https://www.theguardian.com/world/2019/mar/14/greta-thunberg-nominated-nobel-peace-prize I am celebrating an older anthology by and including so many women poets and writers, plus considering what I knew you would focus on, I spoke a bit about our strange weather Wednesday, a weather phenomenon that had never happened before. Climate change? Yes! Wow, Heidi, I am definitely much more in the know about this issue and the movement that is happening around this important global issue. Thank you for all of the helpful links for readers to further educate themselves. Hope you are having a good year! Thanks for hosting! The more people that are Eco-conscious, the better. You have highlighted the global action of the young people of the world regarding the ineffectual response of older generations with respect to climate Heidi, and you have it most effectively. I personally find it most gratifying that so many young people wish to actively participate in democracy. The poem you have chosen is a most powerful addendum. Thank you for hosting on this significant day. Heidi, your passionate post leaves us without excuse. Thanks for the links and suggestions for ways we can participate. I chose to share "Secretary Bird" too. I loved seeing the pics that popped up and learning more about the bird when I googled it. This post is overflowing with action and ideas and research. Good luck with your march today. Thanks for sharing and being an activist. Thank you, Heidi, for your amazing call to action! I have been MIA for awhile, so I didn't realize about the strikes going on across the world today. I checked and there is, in fact, one nearby. Thank you for your practical list of actionable things. Oftentimes I see something that I would like to help with, but don't know where to start. So thank you! Thanks for hosting. Great theme! I will check out your links. Unfortunately, I did not see the theme until after I wrote my poem about connecting. I recently started work at a Land Trust and we have been discussing climate change and how best to incorporate that concern (I agree that action is needed immediately to avoid catastrophe) in our work. Thanks for all your effort! Carol - at The Apples in My Orchard on Wordpress. Your post today is a gift, Heidi. 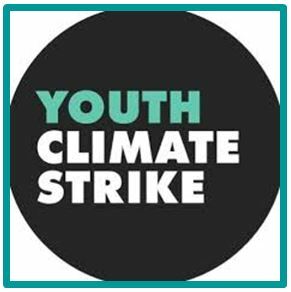 I am supporting #YouthClimateStrike on twitter & am also following up on other links. I look forward to reading the heartfelt & informative PF posts related to climate change & continuing to figure out how we here in our home can do better. We were already buying bulk, refusing plastic bags, etc. the basic & looking into solar panels, electric car & similar actions. But this strong essay speaks Truth - government actions can perhaps give Mother Earth some Time. If not . . . I love Alice Schertle's poetry! Secretary Bird was originally published in her book Advice for a Frog, which has other wonderful poems about animals--including the pangolin, toucans, frilled lizard and black rhino. I am so glad you posted that poem today. It made me pull Alice's poetry books from my bookcase and reread them. Another favorite Schertle book is Keepers--and a favorite poem from the book is A Frog in a Well Explains the World. Hooray for these young people! Thank you, Heidi, for this incredibly rich post with all these resources. I wanted to write a new poem for this important day, but have decided to share one of mine from a few years ago and "Landscape" by Eve Merriam. Her final line is bleak, but the energy of these young people gives me hope. Thanks, Heidi, for sharing all of this wonderful information and inspiration. The poem is poignant and powerful. And I am inspired by these young people who are determined to make a difference in our world. Thank you so much, Heidi, for this rich and passionate post. I appreciated the practical list of steps and all the information you shared. I also appreciate the introduction to Alice Schertle and this wonderful, heartbreaking poem. I will be checking out more of her work, for sure! I'm in late this week with a short poem I wrote about a year ago. Thanks again for hosting and for the gift and power of this post. Heidi, thank you for your comment on my blog. I am dazzled by your casual name-dropping. Wow! And I agree with your prescription for presidents. Heidi, thank you so much for this excellent, powerful post. Your action list is so good, and yes, it's such an ongoing battle to spread the news about the difference between weather and climate! Sigh. The historic flooding (thanks bomb cyclone) that is happening in my area right now is probably due to climate change. I didn't get a PF post done this week, but wanted to thank you for this one.